The What: Symetrix is preparing a comprehensive showcase of the latest developments in its acclaimed SymNet DSP family for this year— InfoComm exhibition. The centre of attention on Symetrix—to date will be the latest version of its open-architecture design software for SymNet Edge and SymNet Radius Dante-scalable network audio DSPs. The What Else: Adding to existing support for select third-party devices from manufacturers including Audio-Technica, Shure and Stewart Audio, SymNet Composer 4.0 heralds configuration capabilities for Attero Tech's newly-released unDUSB Dante unit—an easy-to-use, driver-free 2x2 USB-to-Dante interface set to be deployed primarily for computer-based applications in conferencing systems such as Skype and Microsoft Lync. 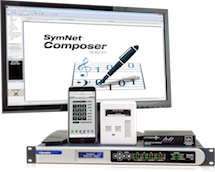 The Bottom Line: In addition, SymNet Composer 4.0 offers full support for two new control options that will also be exhibited at InfoComm 2015. The newly-released ARC-3 wall panel remote arrives in a single SKU with surface- and flush-mounting options, and incorporates a new capacitive touch interface with LED feedback, as well as a multi-language graphics-capable OLED display that is a direct result of end-user requests.